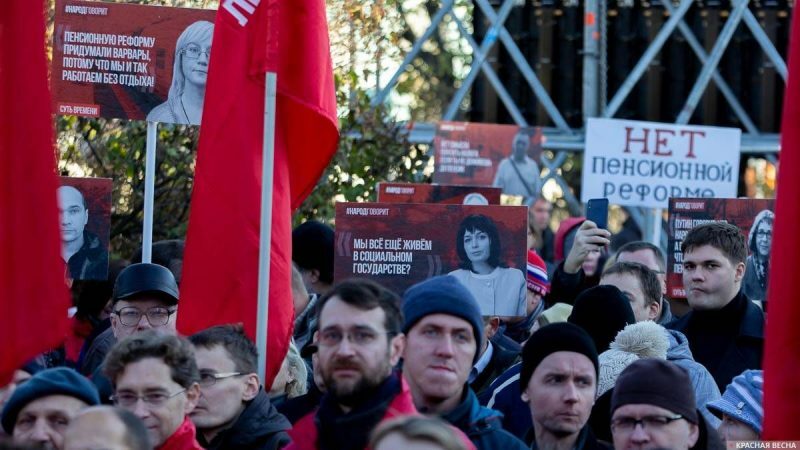 The Essence of Time movement has collected over one million citizens’ handwritten signatures under a petition to the President of Russia, Vladimir Putin, the movement’s leader Sergey Kurginyan said on November 5 at a rally in defense of the social achievements of the October Revolution in Moscow, the Rossa Primavera News Agency reports. “However, a million people addressed the President of Russia personally, not some administrators. And now a million people want a personal reply from the President of Russia, not his bureaucrats,” Sergey Kurginyan said. The people are waiting for Putin’s answer regarding how to stop the disaster leading to the disintegration of Russia, the Essence of Time leader said. On October 25, the Essence of Time movement submitted over one million citizens’ handwritten signatures against the pension reform. On October 3, Putin signed the pension reform legislative package into law. This entry was posted in News from Russia and tagged Essence of Time, October Revolution, Political War, Sergey Kurginyan. Bookmark the permalink.